The perfect way to enjoy tomatoes any time of the year. This is an absolute must-try as the "T" on a BLT. It might just be your new favorite sandwich! Also great on burgers and hot dogs. 1. Drain the tomatoes well (reserving 1/4 cup of the liquid for later use). 2. 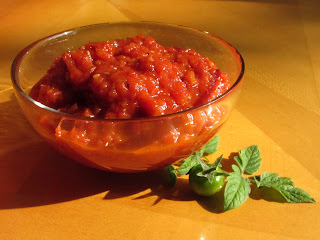 In a small bowl, stir together the reserved tomato liquid, brown sugar, vinegar, black pepper, and cayenne. Set aside. 3. Place a large pan or Dutch oven over medium-high heat. Once hot, add the tomatoes, oil, salt, garlic, and onion. 4. Cook the tomato mixture, stirring often, until most of the liquid has evaporated and a fond begins to form on the sides of the pan. 5. Stir the sugar-vinegar mixture into the pot. Cook, stirring often, until the liquid has reduced and become somewhat syrupy. 6. Transfer the mixture to a heat-safe bowl to cool to room temperature. Pulse the mixture in a food processor to break the tomatoes into smaller pieces. 7. Cover and chill until ready to use.